Most people involved in family disputes would like to have a lawyer help them, but many feel they can’t afford it. Until recently hiring a lawyer was usually an all-or-nothing proposition. You hired a lawyer and turned the conduct of your entire case over to them, or you were on your own. But recently the BC Law Society has authorized lawyers to “unbundle” their services and take on specific tasks for you rather than your whole case, if you want. How does this “unbundling” work – for people with legal problems and for lawyers? Where can you get more information about it? In this eNews, Kari Boyle, BC Family Justice Innovation Lab Consultant and Coordinator, answers those questions. Unbundled legal services (also called “limited scope legal services”) are becoming a popular and more affordable way to help separating families proceed though a separation or divorce with less stress and better results. A lawyer who offers unbundled services will only do tasks you agree on in advance, and they’ll only charge you for those tasks. You’ll meet with them and work as a team to develop a plan to address your legal problem. Then you’ll identify the tasks that you can do and those you want the lawyer to take on. The plan can be crafted to suit your budget and the tasks allotted to suit your skills and comfort levels. For example, if you have a case in family court you might want the lawyer to do legal research, or prepare documents, or give you speaking notes for questioning the other party or speaking to the judge. If you’re going through mediation the lawyer might advise you on the law that applies before you see the mediator, draft a separation agreement after mediation to record what you agreed on, or provide you with independent legal advice before you sign an agreement. How can you find an “unbundled” lawyer? Remote service options for people who can’t get to their office – telephone, web conferences, etc. You’ll find this Roster on the BC Family Law Unbundling Roster website, and there’s a shortened version showing unbundled services by regions on the Clicklaw Helpmap. The Roster is adding a page with helpful information about unbundling and tools for you to use. Coming soon is a “help” function that will connect you directly to the Roster Coordinator via email. Another option, particularly if you need legal services in another province or for a problem involving another area of law, is the National Self-Represented Litigants Project (NSRLP) Canadian national database of lawyers and other professionals who provide unbundled legal services of all types. A note of caution - unbundling may not be right for everyone or for every problem. Unbundling means breaking down a complex problem into a list of tasks or activities, and dividing them between you and the lawyer. You will still be representing yourself without a lawyer for the tasks you take on. So before you decide to unbundle it’s helpful to ask yourself some hard questions to make sure it will work for you. The BC Family Law Unbundling Roster website will soon provide a helpful questionnaire you can use to do this. 1. You could start by paying a lawyer for a comprehensive initial consultation to get information, options and a helpful roadmap. Some Roster lawyers offer this important service and the CBABC Lawyer Referral Service provides a 30-minute initial consultation for $25. 2. Seek free legal services if they are available. Meet with a Family Justice Counsellor. Have you considered unbundling? BC’s Chief Justice Bauman is an enthusiastic advocate of unbundled services as a way to improve access to justice. Consider what he says in a NSRLP video and in a recent blog post on unbundling. 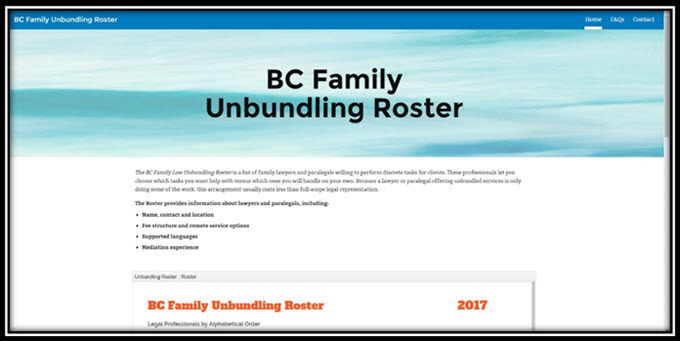 You’ll find a helpful Unbundling Toolkit on the Courthouse libraries’ website, and you can register for the BC Family Law Unbundling Roster there too. You can also register for the NSRLP National Database to offer unbundled services in any area of law.